Hello and welcome to Saia Smile Center! We want to be the first to welcome you to our website and our dental practice! 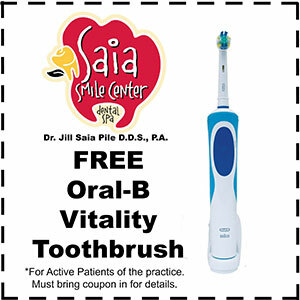 Dr. Jill Saia Pile has been in practice since 2005 and in our new facility since March 2009. We have assembled a very highly skilled team of professionals who are here to change the way YOU feel about dentistry. Our core values here at Saia Smile Center are to establish lifelong relationships based on trust. We focus strongly on educating our patients on how to better take care of them as a whole, paying particular attention to how the mouth is “the opening to the entire body.” (i.e., the relationship between periodontal disease, heart disease, diabetes, and osteoporosis.) We hear repeatedly from our patients that they were “scared to go to the dentist” in the past, but we have relieved their fears, renewed their trust, and excited them to act “preventatively” in their oral health needs. We encourage you to keep your regular recare appointments, so treatment can be diagnosed at an early stage, and prevent you, the patient, from having painful emergencies at inconvenient times. Throughout our website, you will find an abundance of information about our practice, procedures, and dentistry in general. Please explore and learn as much as you desire. Our patients are our most important asset, as referrals are greatly appreciated! If you are interested at all, please stop by for a cup of coffee and meet Dr. Jill. Regardless of your dental concerns, we have mastered delivering gentle, quality care in a comfortable setting. We are delighted to see how we might be able to help you achieve the health you deserve and the appearance you desire! See ya soon….. Proudly serving: Frontenac, KS; Pittsburg, KS; Girard, KS; Southeast KS; Joplin, MO; Carl Junction, MO; Webb City, MO; Southwest MO.